Are you are a Catholic news junkie? Check out the most popular Catholic news apps. They are popular for two reasons: either they are top primary news OUTLETS or content-rich news AGGREGATES. Do you prefer to have timely, up-to-the-minute original source material for your news? Look to news outlets which collect and distribute news with their own reporters, photographers and videographers. Do you want to skim just the top headlines from around the world, the Vatican and/or the United States? You need a news aggregate. If you’re a hard-core Catholic news junkie you may want to select apps from each category. Catholic News Service (Free) Apple | Android| Kindle. Billing itself as the “top Catholic news outlet in the world,” Catholic News Service offers a mobile app to keep you even more connected with what’s happening in the Universal Church along with cultural issues which affect Catholics. Like its web site, this is a simple news feed app which also provides video reports and news photos covering “fully, fairly and freely […] the involvement of the Church in the world today,” as the service describes its mission. CNS is a respected news source operating under the auspices of the United States Conference of Catholic Bishops for almost 100 years. While its web site is content-rich, its app is not; only four stories were posted on the day we reviewed it. The CNS app offers links to its Facebook and Twitter feeds, conveniently packaging its digital content in this single app. As much as the mobile app is sparse in content, the CNS Twitter feed will positively overrun your Twitter scroll, as most news outlets are prone to do. Catholic News Agency (Free) Apple | Android. Today, this is service is an apostolate of EWTN. Established in 2004, CNA is one of the fastest-growing Catholic news providers to the English-speaking world, according to developers. The mobile app gives you access to not only its news texts but also to video reports and news photos. This app delivers lots of daily content, and it segments that content into four categories: World, USA, Vatican and Americas. For major events like a papal trip, CNA will segment those news stories in a separate category. In addition to news, CNA provides daily Mass readings and Saint of the Day. This gives the app a smigit more value. Like Catholic News Service, Catholic News Agency covers the Church with its own reporters stationed around the world. With its Facebook and Twitter links included, the app operates as a single portal for CNA’s digital output. News outlets tend to overtake your Twitter feed; this one is no exception. As the name suggests, this re-branded Vatican News app provides up-to-date (even live!) content connecting you with all things dealing with not just the Pope, but the Vatican, the universal Church and (Catholic) World news in those four categories. This app was developed by the Vatican’s relatively new Secretariat for Communication as the official network hub based on its web site. So, its original content encompasses the entire Holy See and anything concerning the universal Church that would be of interest to the masses. Content includes news reports, press bulletins, video reports, video of events in their entirety (some of it live), the three dependable elements of the pope’s schedule (Angelus, General Audience and Santa Maria daily Mass homily) and more. 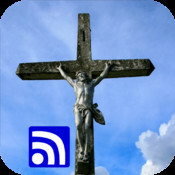 The app also offers daily readings, Saint of the Day, Vatican News Radio (old Vatican Radio) programming on 11 channels. The radio news reports are offered in text and audio. In addition to news outlets, many of the separate social media accounts associated with the Vatican are now consolidated under this new Vatican News hub. This includes Facebook (the Vatican’s page as the pope doesn’t have a Facebook page), the pope’s Twitter account (@Pontifex), YouTube and Instagram. These consolidated social media outlets have consolidated audiences/readers as well, causing their engagement numbers to rise. And social media is taking on some significant content responsibilities for Vatican communications– for instance, much video has been farmed out to the YouTube portal; the old “galleries” are pushed to Instagram. National Catholic Register App Apple | Android, is a service of EWTN. It’s home base is the popular national Catholic periodical of the same name owned by EWTN. This app– from a faithful and award-winning Catholic perspective–comes fully loaded with current news from the Vatican and around the world, commentary, reviews and meaty features following the pro-life movement, business, literature, politics, entertainment, education and more. + Links to popular Catholic bloggers like Bishop Robert Barron, Dan Burke, Edward Pentin, Fr. Dwight Longenecker, Msgr. Charles Pope and more. Catholic News Live ($.99) Apple | Android. Read through all the latest Catholic news and opinion from around the world through this news aggregate. You can view the news in a list or on a map, and share stories with your friends through Facebook, Twitter, and other services. You can even send stories to Instapaper or Read It Later if you’d like! CNL culls news from hundreds of different Catholic websites on your mobile device, and lets you view and share news and blog posts directly from the source. The news feed includes some of the more popular Catholic blogs. Content is biased towards Catholic orthodoxy in adherence to the teaching Magisterium of the Church in unity with the US Catholic bishops and the Pope. Catholic News Feed (1.99) Apple only. This is a terrific one-stop-shop for all your PRINT Catholic news because it bundles a wide selection of Catholic news sources (text only) all at your fingertips: Catholic News Live; EWTN News; National Catholic Reporter; Catholic World News; National Right to Life News; Catholic News Agency and its segmented news outlets covering Catholic News USA, Vatican Daily News among others. This app is strictly utilitarian in interface–no trendy logos or elegant navigation features. We cannot quite get that last field on the main menu to be operable for selection on iPhone 5. It is regrettable that the links to CNA’s stories take you to the full web site and not CNA’s mobile version. Other than those operational glitches, the app overwhelms you with news and commentary from sources leaning on both sides of the orthodox spectrum, left and right. Anytime you see EWTN News and National Catholic Reporter together in a mix, you know you’re getting a spectrum of thought in gathering news and commentating upon it. Granted, most of those news sources can be accessed FREE on the internet. The two bucks you plunk down for this app pays for the convenience of having those sources bundled together within a single app icon on your mobile device. EWTN News (Free) Apple | Android|Kindle Fire We are familiar with EWTN’s live (and on demand) radio and television broadcasts which include its news product. But the EWTN news division also includes in this app news in text format (primarily from its affiliation with Catholic News Agency) segmented into US Catholic News, Vatican News, World Catholic News and Catholic News in the Americas. USA Catholic Church App (Free) Apple | Android. This is the United States Conference of Catholic Bishops’ all-inclusive The Catholic Church App. As the title suggests, it is an attempt to bundle parishes and (arch)dioceses across the United States—even the Vatican—into one, single mobile resource. It doesn’t do all that very well, but you’ll get coverage on news of concern to Catholics from the Vatican and Catholic News Service (including CNS videos) News–The app opens up to the day’s latest Church news in text and video from the US bishops’ own CNS service–much appreciated because even if you aren’t a news junkie, the headline might very well grab you and help keep you informed, if only a smidgin, about what’s going on in the Church. Here you can scroll text and video reports. Reports of opinions of various bishops, archbishops and cardinals during the Synod on the Family, for example, were wide and varied. Their inclusion adds depth to coverage we don’t normally see in secular media. iMissal ($4.99) in Apple | Android | Blackberry Contains a Catholic news feed in addition to the complete Roman Missal (English 3rd Edition), big collection of prayers and daily Scripture readings. Requires internet access for the news feed. The Truth & Life Dramatized audio Bible New Testament ($19.99 or separate books $1.99 ea; Download Free version includes the Gospel of Mark on audio and a complete Bible text, RSV-CE translation). Apple |Adroid | Windows PC | Kindle Fire | Nook. This app comes with the Catholic News Agency app imbedded. Get news from the USA, Vatican and around the world along with links to compelling commentary. You should have a Bible loaded onto your mobile device anyway. Why not select this app and get a reliable Catholic news app to go with it?